In the last two months, my husband and I had both of our cars totalled in car accidents – and we also discovered we're expecting a third child. I got the news after I replaced our 2006 Volvo V50 with a 2014 Volvo XC60. Now we need to replace the second car with a used sedan or SUV for around $15,000. It will be a secondary car, but it needs to be safe, roomy for three children and reliable in Saskatchewan winters. We'd prefer smaller over larger for gas consumption reasons and all-wheel drive (AWD) is a plus. My husband hates North American cars. We've come a long way since 30 years ago, when it wasn't unheard of for parents to cram four children into the back of a Plymouth Reliant station wagon during prairie winters. Cars are much safer now, and you don't necessarily need a minivan to fit two children and a car seat. If you're looking at cars manufactured in the last decade, it's tough to find one that isn't safe or reliable. At a minimum, look for electronic stability control – it has been required in all cars since 2012. And even if you get a car with AWD, get winter tires. Top U.S. Insurance Institute for Highway Safety (IIHS) picks priced around $15,000 include the 2014 Mazda3 ($11,757), 2014 Hyundai Sonata ($14,389), 2013 Honda Accord ($15,014), 2014 Toyota Corolla ($15,037) and 2014 Subaru Impreza ($15,052). The Mazda and Impreza come in handy hatchback versions, but only the Impreza has all-wheel drive. "A comfortable ride, responsive handling, good visibility, simple controls, and a relatively spacious rear seat all combine to make the Impreza easy to live with," Consumer Reports said. The fourth-generation Impreza 2.0i (2012-2016) has a 2.0-litre four-cylinder and gets decent gas mileage for an AWD vehicle, whether it's 8.7 litres/100 km with the continuously-variable transmission (CVT) or 9.6 litres/100 km with the five-speed automatic. Edmunds griped about the CVT's engine noise and slower acceleration than its rivals. For a rear-view camera with the 2014 model, you need the limited package – it was standard on all trims after a 2015 facelift (which added Subaru's optional EyeSight system of safety tech, including automatic emergency braking). 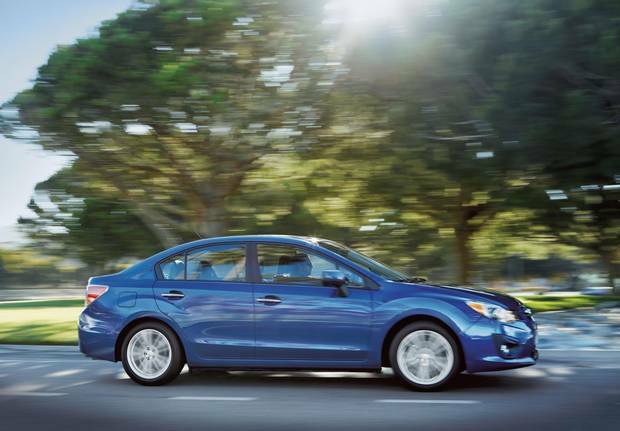 Consumer Reports gives the 2014 Impreza five out of five for reliability. There were no recalls. Does bigger equal safer? To a point. An SUV generally offers more protection than a compact car or smaller sedan, the IIHS says. Two top safety picks in your price range are the 2013 Subaru Forester ($14,550) and 2012 Honda CR-V ($15,762 for AWD). We'll look at the 2012 CR-V, part of the fourth generation (2012-2016). Consumer Reports recommended the CR-V for easy access, "one of the roomiest rear seats in the class," standard rear camera and available safety tech. It complained about a stiff ride. Of the three trims, LX, EX and EXL, Consumer Reports said the best overall value is the EX, but "sticking with the LX skips over the very annoying touch-screen audio system." With a 2.4-litre four-cylinder and a five-speed automatic, fuel economy was decent – 9.3 litres/100 km. Consumer Reports gave it a four out of five for reliability. There were two recalls, including a fix for a door latch that could get jammed. What's smaller than a minivan, seats at least six and is cheaper than an SUV? Mini-minivans, like the six-seater Mazda5 ($14,536 for a 2014), seven-seater Chevrolet Orlando ($14,655 for a 2014) and Kia Rondo, which comes in a seven-seat version ($14,007 for a 2014). The Mazda5 has handy sliding rear doors, plenty of elbow room and a third row that splits 50/50. It doesn't have AWD, but it's fun to drive – although you'll notice a lack of power when passing a semi on the highway. Its 2.5-litre four cylinder and five-speed automatic (there's also a six-speed manual) gets 9.8 litres/100 km. 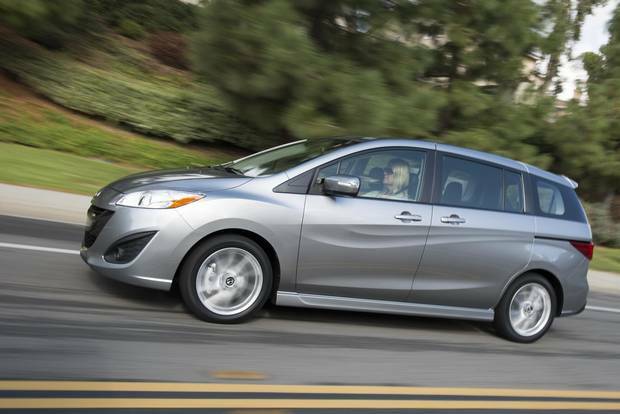 Consumer Reports gave the 2014 Mazda5 four out of five for reliability, down from a perfect score in 2013. The bad news? There's no rear-view camera, and it had marginal side impact safety scores in IIHS tests. There was one recall. Have a suggestion for a safe, roomy car for this Saskatoon family? Join the conversation at globedrive.com.